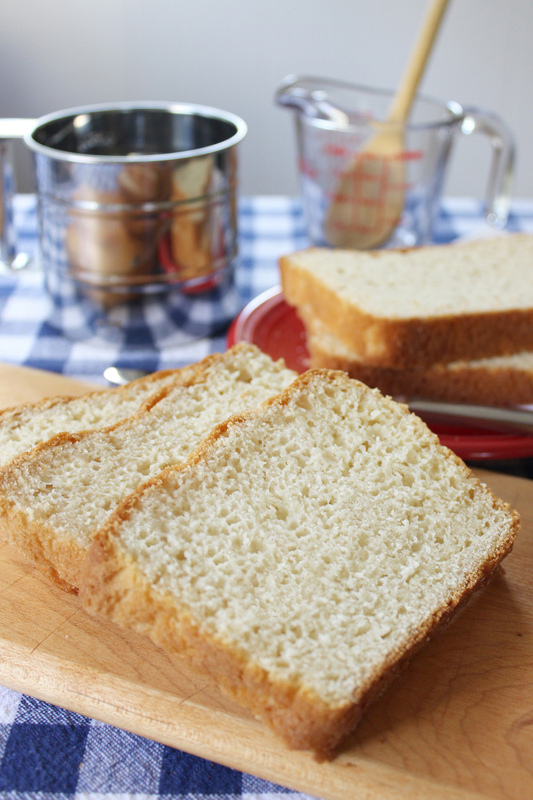 This tender, hearty, homemade buttermilk yeast bread is a gluten-free dream come true. In a mixing bowl, combine the wet, room temperature ingredients and mix well. All dry ingredients, including the Active Dry Yeast, should be thoroughly blended together before adding to the wet ingredients. Mixing them together in a bowl with a wire whisk or shaking them together in a gallon size, self-sealing plastic bag is suggested. Gluten-free flours are very fine and need to be well blended before liquid is added to them. With the hand mixer on a low speed, gradually add the dry ingredients to the wet until well blended. Beat about 10 minutes. Pour batter into three 2x5-inch greased bread pans or one large 9x5-inch loaf pan; allow to rise approximately 1 hour. Bake at 375°F for 30 to 60 minutes respectively; use a toothpick to test for doneness. NOTE: We recommend using Active Dry Yeast in gluten free recipes. The fast action of the instant (Quick Rise) yeast may cause the dough or finished loaf to collapse. You can substitute Instant (Quick Rise) in place of Active Dry Yeast in gluten free recipes. When using Instant Yeast, expect your batter/dough to rise faster - about 50% faster. Adjust your rise times accordingly. Traditional methods: substitute equal amounts; Bread Machine: use ½ tsp Instant Yeast OR ¾ tsp Active Dry Yeast per cup of flour in your recipe. Visit Gluten Free tips and Lessons in Yeast & Baking for more information. Best loaf I’ve made so far. I’ve tried a handful of recipes and variations on those recipes. They all tend to over rise and fall. This is the 1st loaf that looks like a regular loaf of bread. I replaced the the 1/2 cup of tapioca flour with 1/4 cup of cornstarch. I used 1 and 1/4 teaspoon of yeast. I baked it on the sweet bread setting on my bread machine as a 1.5 lb loaf with a light crust. Very pleased with the results. I used all purpose gluten free flour…two total cups. I also did the yeast different. I dissolved the yeast in a 1/4 cup warm water with a tablespoon sugar. I let it set till it was nice a bubbly. I added it to the wet right before I added the dry. I used the traditional method. It came out nice a soft. I did butter the crust right after I removed the bread from the oven. I loved the texture and taste of this bread. But I had a problem with the dough being so soft that as it rose it kinda spilled over the pan sides. It still had loft and cooked all the way through, I was even able to slice it! Just curious if anyone can advise me on this. I’m new to GF bread baking. I used ground chia seed and replaced the potato starch with rice flour. Also I was wondering how you could use this for making rolls, the consistency was more like a cake batter than bread, way to soft to form rolls? Thank you all for any help I can get with this. Best GF Bread So Far! This bread is moist and flavorful and lacks the grittiness and brick-like quality of other gluten-free breads. I made it in my Zoijirushi bread machine, and it came out great! I would recommend trying the dark crust cycle if you have that option because I think my first loaf may have been too moist on the medium crust setting. I’m rather new to gluten free baking. I have tried a few recipes from other sources. When I stumbled on this site, I was amazed. Lots of great information and recipes all together. I couldn’t wait to try this buttermilk bread. WOW! The tastiest loaf I’ve made so far. (I made mine using a standing mixer). It’s NOT dry and crumbly, falling apart before it reaches the toaster. It’s NOT weird tasting. Red Star yeast, thanks for taking Gluten Free baking seriously. I would highly recommend this site to anyone starting with Gluten Free baking. If you’re just starting, take time to read through the recipe and tips. It is different than regular bread making. Thanks again Red Star. I have been gluten-free for almost 34 years. I don’t remember when I first started making this bread, my original recipe is so old and yellowed. But it is my go to recipe for everything. I can make loaves, buns, cinnamon rolls, and pizza crust with this dough! It just works and is the most hassle-free bread I know of. It comes out of the oven and smells divine and taste wonderful. I suggest this recipe to all newly diagnosed celiacs. You can mix up the flours and make your own bread mix. (White and brown rice, tapioca and potato starch and sorghum flour). As long as you use 3 C ‘s it works. Thank you for this wonderful recipe. Nanci, what are the 3 C’s? Nanci, I am a few years late in finding this WONDERFUL recipe!!! It’s the ONLY one I use now. Just wondering how you handle this dough when making buns or cinnamon rolls? I can tell that this recipe would perfect for making those too!! Best GF bread recipe we have found (we have been searching for 8 years). Easy to make in bread machine. Rises tall and stays tall- doesn’t fall like other breads.